If you’ve never been through a financially lean season, consider yourself extremely blessed. I find that even the most financially savvy families go through a period of time where finances are tight or simply non-existent. Most times is due to a job loss, illness or an unexpected emergency. Regardless of the reason, I think we always have to be prepared to get through a rough financial season. Why? Because if we don’t plan for it, the effects can be financially devastating. Create a budget that includes all of your utilities and debt. What can be canceled out if your income was significantly decreased? Essentials should always be listed first (i.e. housing, food). During our leanest years, I used coupons like it was my business, we cut off our cable and also ditched our expensive mobile plan. We also got rid of a car that carried a hefty monthly payment. I can now appreciate this period of time in our lives because it helped me appreciate the little things in life along with teaching me new frugal living skills. No one wants to think about losing their job or facing a family emergency. But unfortunately it happens all the time, and most families are not prepared for it. Not all jobs offer disability insurance and if they do, not all will approve claims immediately. You have to start saving for those in-between months and beyond. I’ve seen families fall into desperate times because they were relying on unemployment benefits or hoping to find a job right away. Don’t rely on “maybes”, instead prepare yourself the best way you can by saving for those leaner months. When money is tight you won’t have excess funds to pay off debt. Aside from saving money, consider paying off your debt as quickly as possible. I love Dave Ramsey’s snowball method and find that it works best for us. One way to cancel out a big chunk of debt is to find ways to earn extra income to pay it off quicker. If you have a car loan, consider getting rid of your vehicle and buying a car with cash. If you get a refund during tax season, consider paying off debt instead of using it to upgrade electronics or go on trips. Paying off debt requires serious sacrifice, but it will all be worth it in the end. Cut back on your commitments. Repurpose furniture instead of buying something new. Go grocery shopping once a month. I grew up in a low-middle income home and watched my mom make something out of very little. Her meals were simple, yet tasty. Our furniture was inexpensive, but our home was always tidy and clean. I never felt deprived or like I was missing out on anything. I’m now grateful that I didn’t get everything handed to me as a child because it has helped me appreciative everything I now have. 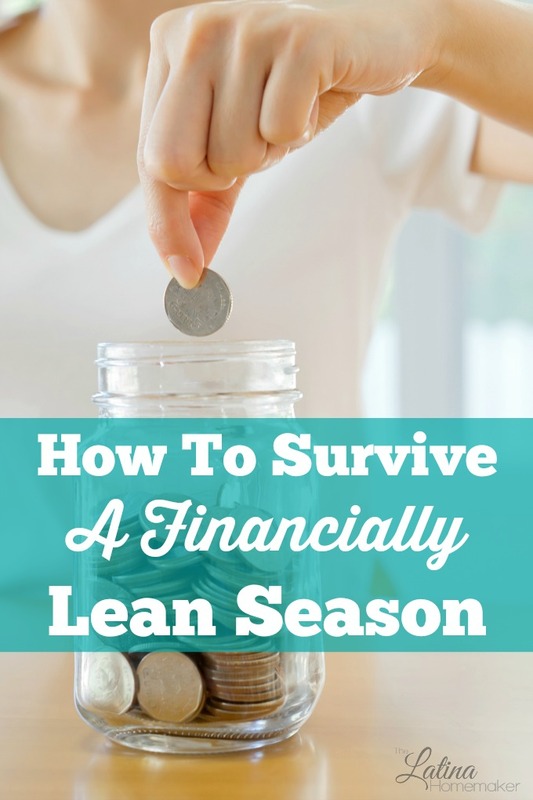 Are you financially prepared to survive a lean season? I’d love it if you shared your tips! The past two years for us have been financially lean, but we’ve still been not so wise with our money (because, though less income than we had before, we still had plenty to play with…allegedly). Instead, we should have made saving a higher priority. Sure, we still tried to put some away, but we also fell into the “well, we can afford…” and so we did. I read recently that you should take the word “afford” out of your vocabulary, simply because it tricks you into thinking you can spend more than you should (and I fully agree with that). Now, I’m trying to find sneaky ways to save money here and there, and am trying to not want anything except what we need to live. I normally have a few things that I’m looking towards getting, but no more (because, usually, I end up getting those things I”m looking at). Had to put that in practice last night, actually. Saw a beautiful planner on YouTube, so I went to Amazon…just to look. Found the Maldens on sale for 70$ which is a crazy good deal. Technically, I have that much money in Amazon credits (Christmas money and Swagbucks payouts), so it would have been at no real cost to us. It would have been amazing! But I’d already told myself that that Amazon money was to be for things that we actually needed (like lights for the living room!) not just things that I wanted. It was sad to say no to such good deal, but they’ll be on sale again. I also have a Finsbury that I can use if I want to be in rings that badly…so instead, I’m moving into my Filofax for a few things and will be happy with that, ha! I think saving ahead of time is key! We don’t have any debt but there will always be lean times ahead. So, we try to keep our emergency fund funded with several months of expenses, as well as some other savings accounts for necessities. It is a relief to know the money is there already for when we need it.